None of us get to choose our ending. If there’s any poetry in our last breath, it’s either accidental or a direct result (a culmination) of how we’ve lived, who we’ve touched, and what we’ve left behind. The great Iranian filmmaker Abbas Kiarostami did not intend the sublime 24 Frames to be his final work. When he died in a Paris hospital on July 4, 2016 (a likely result of medical malpractice), he was near completion on this project and in early preparation on a narrative feature to be shot in China. We can only speculate as to when and if Kiarostami became aware that his mortality was imminent. 24 Frames nonetheless seems profoundly informed by that possibility . . . as well as its opposite. It occupies an ever-evolving space between living and dying, between purgatory and possibility—appropriate for a movie that, in short, is about bringing a series of still images to life. “I always wonder to what extent the artist aims to depict the reality of a scene,” the director notes in an opening text crawl. “Painters capture only one frame of reality and nothing before or after it.” The ‘before’ and the ‘after’ are what Kiarostami, in collaboration with visual effects supervisor Ali Kamali, imagines in this succession of 23 photographs and one painting, in which select elements have been computer-animated. The painting comes first: Dutch-Flemish artist Pieter Brueghel the Elder’s The Hunters in the Snow (1565), which depicts a trio of trappers and their dogs returning from a fox hunt. As the image fades up, it is the frozen landscape that we know—the one that hangs in Austria’s Kunsthistorisches Museum and which was memorably utilized by Andrei Tarkovsky in Solaris (1972). Then snow starts to fall from the sky, smoke rises from the chimneys of houses on the horizons, and animals (birds, dogs, cows) move through various planes of the canvas. One of the canines—a pleasingly cheeky touch—even lifts its leg on a tree in the foreground. Despite Kiarostami’s additions (we might better say his extensions), the painting remains itself. Every element that existed prior to the animations stays where it is, as it is. So we have the dual sense of a fixed moment in time overlaid by and interacting with moving ones. The Brueghel landscape is also the only one of the “24 frames,” each of which runs for approximately four-and-a-half minutes, that begins and ends in stillness. All of the others, adapted from 23 photographs taken by Kiarostami himself over the course of his career, have, from start to finish, in-motion aspects and aural cues (the created-from-scratch soundtrack—itself a prodigious achievement—is primarily recordings of nature and the city with occasional musical accompaniment). So we are left to ponder what has been added or altered. What are the fixed elements and what are the manipulated ones? Those thoughts recede the longer 24 Frames goes on. Indeed, the boundary that separates still photograph from motion picture proves to be beside the point, much as it’s immaterial to the impact of Kiarostami’s heady romance Certified Copy (2010) whether the central couple (Juliette Binoche and William Shimell) are long-term partners or total strangers. The finest art traps us in that liminal space where questions are posed and answers, though perhaps hazily apparent, remain just out of reach. To be able to fully pin a work down—in terms of substance, essence, meaning—is to reveal its fundamental emptiness. Truth, gauzy by nature, can only ever be danced around, suggested. Parallel this to poetry (which Kiarostami also practiced throughout his life in original compositions and via translations of masters such as Rumi): it’s as much what’s between the lines as it is the lines themselves. 24 Frames thrives on the tension between the there and the not-there. What is the source, for instance, of the two off-screen gunshots that incite the action in Frame 4? The sound causes a murder of crows to scatter and a herd of reindeer to stampede (two of the antlered beasts hold back and find each other amid the chaos). An origin point for the bullets is never identified, nor are any of the animals felled. Yet the possibility of death remains omnipresent, lingering over the scene even as, to borrow a portion of a prior Kiarostami film title, life goes on. This uneasy aura carries over into Frame 5, in which a deer nibbles on some grass on the outskirts of a forest until it is shot down just before scene’s end—the threat of the preceding sequence fulfilled, one poem bleeding into the next. It should be noted that 24 Frames doesn’t treat death with horror so much as with sobering acceptance. There is equal likelihood that life will endure as be snuffed out, proportionate possibility that comedy will exist alongside tragedy. For all the birds of ill-omen herein, such as the crows or ravens that hop along a seashore barrier (Frame 7) or ominously peck at and peek in windows (Frames 6 and 20), there are others, like the seagulls sitting sentinel atop shoreline posts in Frame 8, or a pigeon whose shadow is soothingly cast on a window shade for the duration of Frame 12, that capture a gentle quality of perseverance. In one of the few segments with human beings (Frame 15), a group of mostly older men and women, clearly the photographic components, the immobile constants, stand looking at the Eiffel Tower while other people (a musician, students, parents, each photographed for the movie) parade in front of them. Billowy clouds and leafy branches, which are essential features of most frames, likewise shift with and among the elements (snow, rain, wind). Even a sequence (Frame 23) revolving around the cutting down of two trees sees its undercurrent of devastation counteracted by evident lumber piles in the foreground. The trees will go on in different form. The universe stands firm. All of these visions, however, are finally fleeting—here and then gone, bookended by fade-ins and fade-outs, a birth-death cycle 24 times over. That title is no accident: Kiarostami is lending still photography (which captures a single moment—enshrining, embalming it) the characteristics of cinema, in which 24 such moments add up to a single second of moving time. Though even this has its fair share of complexities and nuances, especially nowadays as the decades-long dominant form of celluloid has segued to variable frame rates and primarily digital capture methods. 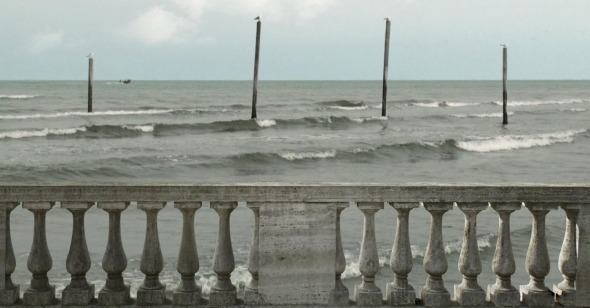 (Kiarostami was an early pioneer in DV artistry, and one sequence here—Frame 16, involving a group of ducks on a beach—plays like a compositional and thematic expansion of a sprightly passage from his exquisite 2003 digital feature Five Dedicated to Ozu.) A further bit of poetic coincidence: 24 Frames was always intended to have 24 scenes. Just before his death, Kiarostami narrowed down the 40+ sequences he had created to 30, the frame rate of NTSC video. His son, Ahmad, who oversaw the project in final postproduction after the loss of his father, picked the six segments to excise, bringing the total to 24, the standard celluloid frame rate. From parent to child, from video to film…and back again? Each sequence in 24 Frames begins with a simple title card (“Frame 1”; “Frame 2,” etc) that feels as if it is counting down even as it is counting up. We know that, once we arrive at “Frame 24,” an end will come: the cessation of a movie, the close of a career. How do you sum up a life? Especially when it’s your own. We’ll leave such matters to the gods (if they exist), to the ether, and to the literal-minded commentariat. For myself, I’ll just say I can think of few things more eloquently hopeless and hopeful as “Frame 24,” which manages to blend such disparate ingredients as a slow sunrise, a sleeping teenager, the sound of leaves rustling in the wind, the ghostly light of an iMac, the final scene of William Wyler’s The Best Years of Our Lives (1946), and an Andrew Lloyd Webber needle drop into something beautiful and terrifying, simple yet startling—a digitally augmented reminder that each of us is part of something bigger even as we are, at the same time, alone.